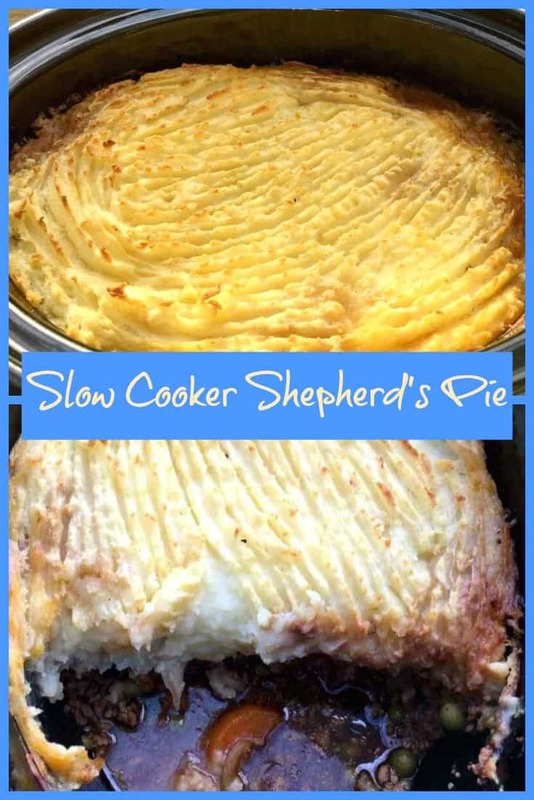 My slow cooker shepherd’s pie is an easy meal which your whole family will love. 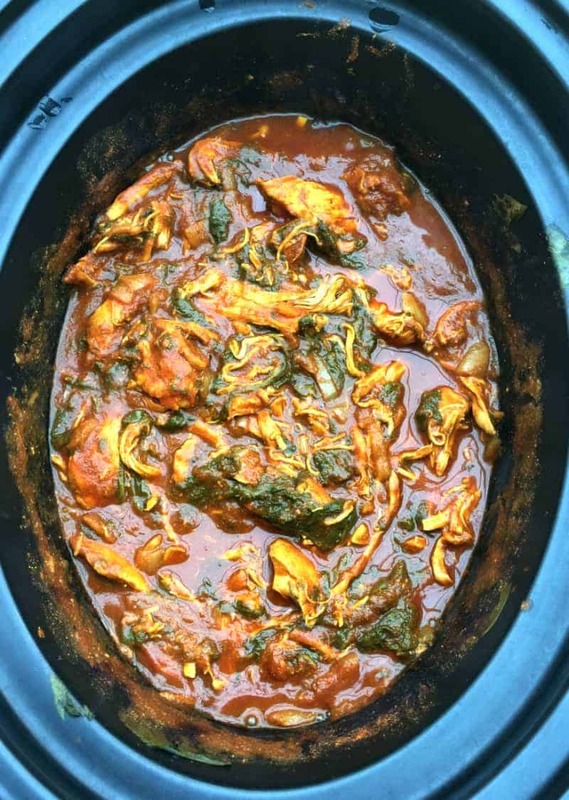 Prepare it earlier in the day and then leave the slow cooker to work its magic, it is perfect for a family mealtime when you are short on time. You’ll love the rich lamb filling topped with soft and crispy mashed potatoes! 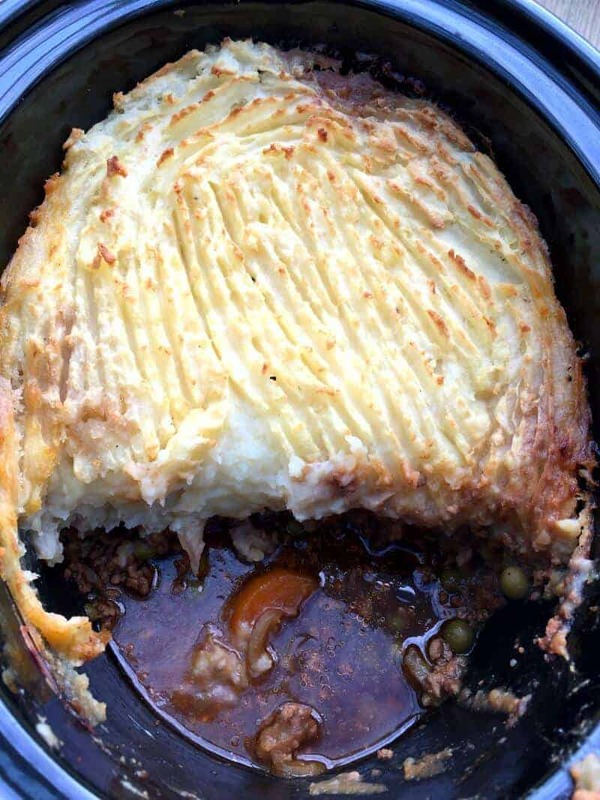 Traditionally made with leftover lamb from a Sunday roast, for this slow cooker shepherd’s pie you can either chop up some leftover roast lamb or use fresh lamb mince (ground lamb). It depends on what you have available. I have tried both ways and they both work well. So flexible and easy to do whether you have leftover lamb to use or not! And isn’t it great to use your slow cooker to make a one-pot meal the family will love. How Do You Even Make a Shepherd’s Pie in a Slow Cooker? Think of a shepherd’s pie and you won’t immediately think you can make this dish in your slow cooker. But it is possible, you just have to use a few hacks to make sure the mashed potato topping doesn’t sink into the lamb filling, and to brown the top. This is the ultimate lazy dish really, as you make the lamb filling in the slow cooker and cook it for a while, and then you put the mashed potato on top inside the slow cooker, and so don’t have to use any more pans to bake it in the oven! For me if I was making it the traditional way I would be using one casserole dish to make the lamb filling on the hob, another pan to boil the potatoes for the mashed potatoes, and then one more baking dish to layer up the meat filling and mashed potato topping and then bake it in the oven. 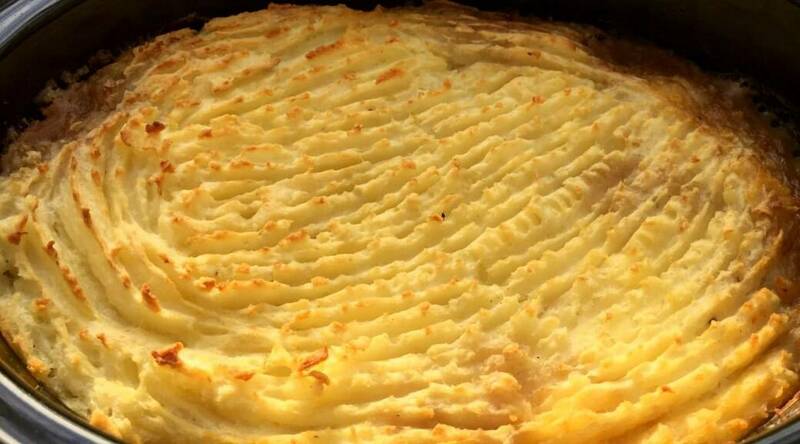 This method saves one pan as you just use the slow cooker and the pan for the potatoes! Ideal if the last thing you want is more washing up to do. It turns out very well, the lamb becomes very tender and the mash does not sink into the pie, and remains moist. Definitely a recipe I will make again and again. 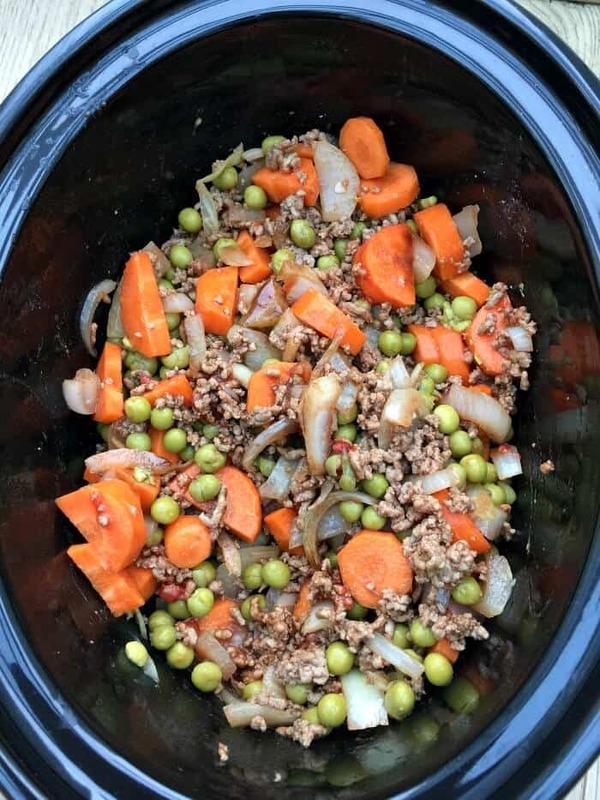 My kids really enjoyed my slow cooker shepherd’s pie and it was much less hassle for me. Win-win situation! 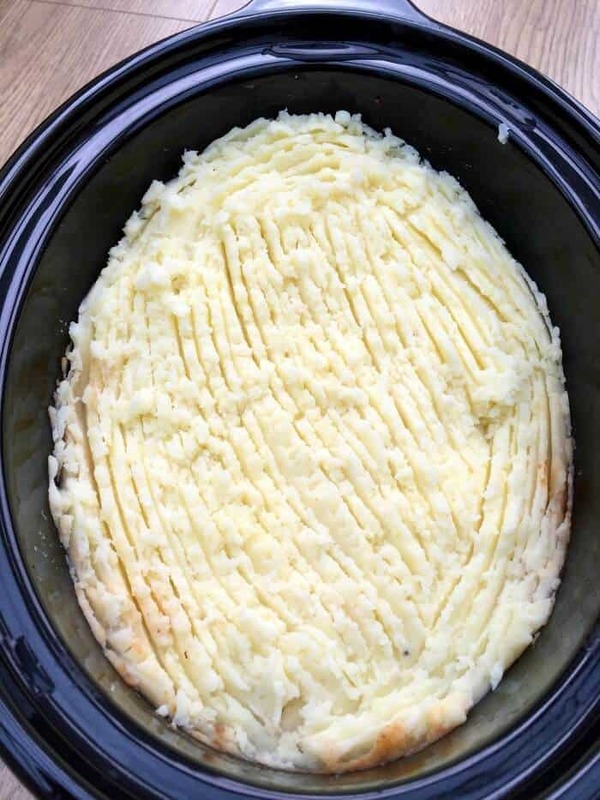 How Do You Prevent the Mashed Potato From Sinking into the Shepherd’s Pie in the Crockpot? The key is to add the mash only 1-2 hours from the end of cooking, not at the start. This means there is less time for the mashed potato to sink! 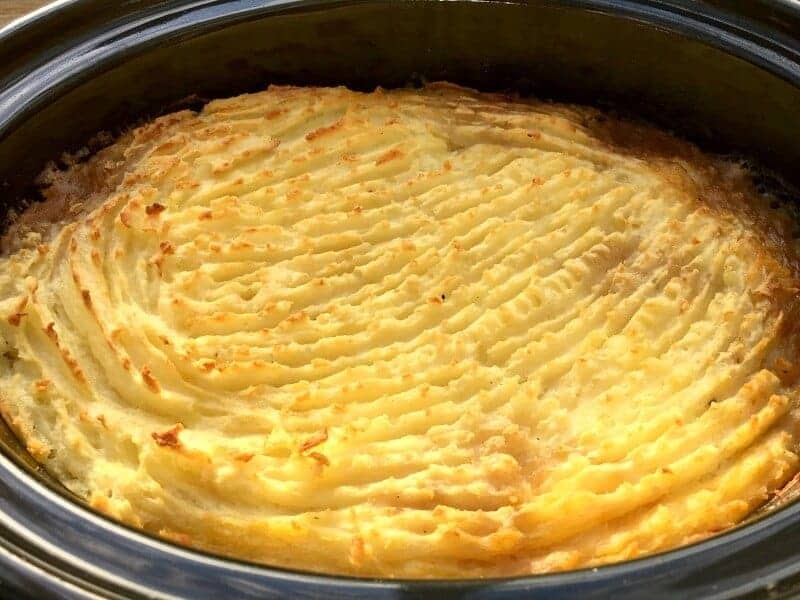 How do You Brown the Topping of a Slow Cooker Shepherd’s Pie? Oddly, while I always find that slow cooker lasagne gets a brown and crispy top on its own, mashed potato doesn’t seem to take on colour in the slow cooker alone. So at the end of the cooking time you simply brown the top of the shepherd’s pie under the grill (broiler) for a short time. Make sure your slow cooker pot is safe to do this with first, the sear and stew slow cookers have metal pots and can be used this way. Mine was an old ceramic pot and I put it in a baking tray so that if it did crack I wouldn’t lose the contents all over the oven. Thankfully it was fine! The last thing you would want is that mess. Why not pin it on Pinterest? What kind of crockpot are you using ? This was made in an oval 3.5 litre slow cooker. I will add it to the recipe notes for future reference! First time making a traditional Shepherd’s Pie – it was delicious! Putting in the slow cooker was a bonus. Can I thicken the gravy before I put the mash on top? Making this just now, smells amazing! Yes do if it seems runny, maybe with cornflour! Making this just now before I put the mash on top can I thicken the gravy? It looks too runny for me. Can’t wait to taste it! The last step of “browning top of shepherds pie under the grill for 20 mins” ??? Does that mean literally take the crockpot insert in the oven under the broiler? I was unsure. Please clarify for me thanks! Sorry not sure what a broiler is, but if it means the grill in the oven then that’s what I did. 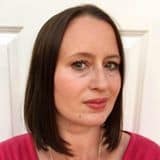 Please make sure you read my warning about making sure you slow cooker pot is safe to do this with. 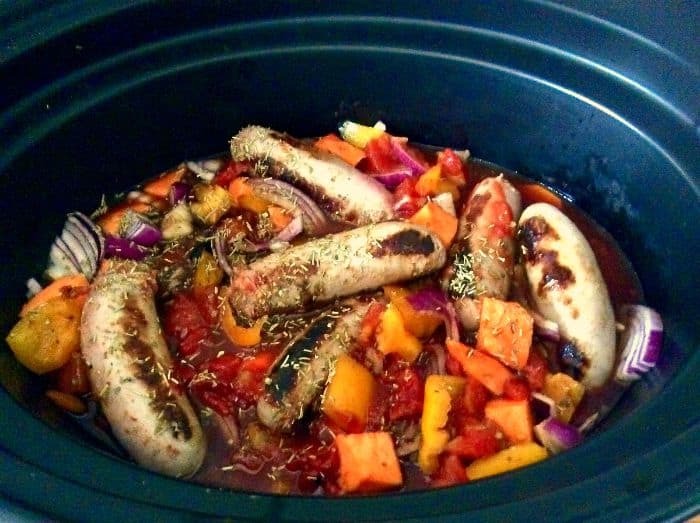 What size slow cooker have you used for this recipe? 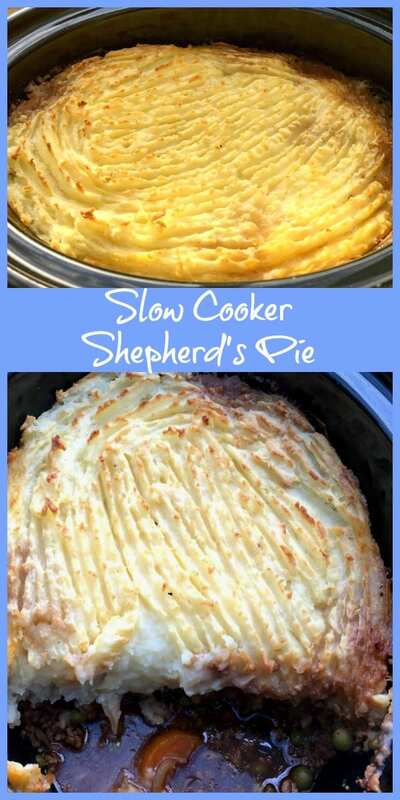 A great way to cook the shepherds pie in the slow cooker. Having less pots to wash up is a winner for me too!